﻿ New innovative Water Cleaning & Recycling System. | For the many people (today more than two Billion people) living in areas with water shortages and housing shortages around our world. New innovative Water Cleaning & Recycling System. For the many people (today more than two Billion people) living in areas with water shortages and housing shortages around our world. A new innovative Water Cleaning & Recycling System for household water. Not for potable drinking water! My name is Börje Brandt, situated in the Northern part of Sweden and I'm presenting a new innovative environmental friendly and scalable water cleaning & recycling system with an expected Hugh reduction capacity of water usage. The reduction capacity is estimated to be up to 3.500 percent per person, calculated on Swedish water usage of 175-200 liter per day/person. The average use (loss of water) is estimated to be around 2,5–4.5 liters of potable water per person and day for showering, washing hands and do the dishes. That loss of water needs to be refilled into the system. Preliminary size: 2.200 x 2.200 x 500-600 mm. System volume: from 800–900 liters. The solution is both for indoor deployments in colder climate and for outdoor deployments in warmer climate. From a Swedish perspective there will be a estimated drop from 65.000-73.000 liters of water per person and year down to around 2.000 liters of water per person and year that will be used for showering, washing hands and do the dishes. This scalable water cleaning & recycling system can be integrated in the house ordinary water and waste water piping system if they have such a system and mounted outside the house on the south sunny side or inside. In the kitchen a new water crane for the recycled water, can be mounted on the kitchen-sink/bench (with a children clasp if needed) together with a new slushy-sink where disposals such as leftovers from food, liquids such as milk, coffee, tea, chocolate, juice, lemonade, alcohol etc. will be put into. A loose inner pod/basin that is receivable can be used instead due there are many hundred million households that don’t have a kitchen-sink. The slushy water will be used for irrigating flowers & vegetables. Slushy biomass will be put in a compost or topsoil toilette. I will also promote the use of organic and bio-degradable products. This new innovative water cleaning & recycling system will focus on single houses and summer or country houses together with Eco-villages that are situated in regions with water scarcity. It’s also more cost efficient to integrate to a year around house or summer or country house instead of connecting to a municipal sanitation system. That if you use a topsoil or a low-flush water toilette. This water cleaning & recycling system will also make it easier to set up groups of small house cabins for example students, young adults, none de jure staff in mining industry, immigrants, unemployed people moving to major cities for work etc. With this solution the house cabins can be more mobile and adaptable to changes in the labour market or educational changes. For people in developing countries, who needs to conduct walkabouts every day and often several times per day to collect water, this system will enable the people and families so they can refill their water supplies just once a week. In that way, the woman of the household (who often is the one who are collecting water) can participate in other productive economic activities and the children can participate in educational activities. People living in informal settlements (slums and shantytowns) often have to pay 5-10 times more per liter of water than wealthy people living in the same city. This scalable system will have a portable shower cabin that will improve sanitation, improve health and improve a better life for people living in regions with water shortages and water scarcity. The concept can also be connected to an irrigating system with greenhouse tunnel tents so the water can be recycled and also to a rain water harvesting tanks. 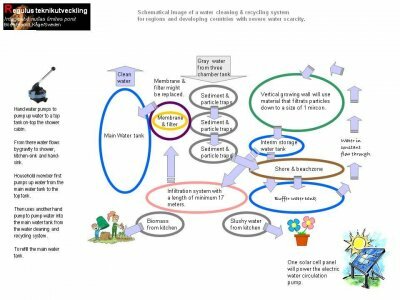 Why clean and reuse water for shower, hand-sink and kitchen-sink use? The climate change consequences will among others raise the average temperature and as for an example the toxic blue-green algae or Cyanobacteria will grow faster. The rising temperatures will also favor other bacteria and parasites that can make water transportation systems toxic, and in the end also poison the humans such as have happened here in Sweden in two major occasions the last years. Scientists are now also investigating if Cyanobacteria can cause the disease ALS. More rainy weather with increased water flows that can create problems for storm drain water systems, and flooding will damage potable and clean water transportation piping systems into the common households. Flooding also makes a toxic tribute to nature due the spread of toxic waste from industries, and that also in the end leaks down to the ground-water systems and gets back to us when we are pumping up new ground-water. And regions with drought and water scarcity will increase and affect larger areas both in developing as in semi-developing countries and the industrialized world. 2050 we expect to be 9 billion people here on earth and that is 2 billion more than today. Conclusion: We need to better protect and minimize the use of clean potable water. For areas that we don’t need to use potable water we need to use recycled water instead, so in that way we can use much smaller amounts of fresh and potable water and utilize it just for drinking purpose. My goal is also to stop the use of potable water to flush away toilette waste! ¤ Decreased stress on the groundwater resources and on fresh drinking water resources. ¤ Can easily be combined with rain water harvesting solutions and water storage tanks. farmers, industry and public users. ¤ Decreased stress on the environment due less transportations with water trucks. ¤ Deceased stress on the very often very poor and leaking sanitation pipelines. products for hygiene, cleaning and detergents usage. ¤ Decreased healthcare problems with better sanitation opportunities. toilette or low flush water toilette with private septic tank solutions. tunnel tent drip irrigating activities. In that way minimal loss of water. ¤ A better awareness from the public! for at least one month each year, according to a new report published in journal PLoS ONE. I'm now searching for crowd funding. Read more on the funding site. © 2013 Watercleaningandrecycling.n.nu. Alla rättigheter förbehållna.